The VSO-BuildAgent and tasks are both published as Open source on Github and allow you use and extend.any way you like. With the ability to run cross-platform builds, I wanted to try out the build agent on Linux. The page on Github describes how to configure your linux machine, but this post from Kees Verhaar describes it much more detail. This is great! But I wanted more. In my previous post I talked about Docker and how I like the idea of having isolated containers that run independently. Running a build agent is a perfect example where you want isolation. Surely you can run multiple agents on 1 machine, but you also need tools which will do the actual work. For that, you need to install compilers, tools etc. Not every agent has the same requirements but they do have the same requirements when you share the same machine. So I decided to try and create a Docker container with build agent. This container can then server as a base container and I can create separate containers for each need. First I needed to set-up my Linux and Docker environment. I described that adventure in my post, [Get started with Docker on Azure for Microsoft Developers and Linux noobs]. After that the building of the Docker container was my next challenge. To create a Docker container from scratch, you need to write a DockerFile. Because I did not really know what I needed I decided to approach it differently. I created a blank Docker container and tried to make the Build Agent work there. I created a connection to my Linux machine in Azure and created a Docker container from the Ubuntu 14.04 image. and then I run an instance with an interactive prompt so I can type commands within the container. Then I followed the steps described on the blog of Kees and Github. Run these commands (not the # prefixed) one by one. Now that you have the vso agent installed, you need to run it. You cannot run as “root” user so you need to add a “service account” for this. Then go to your created directory and run the vsoagent-installer. 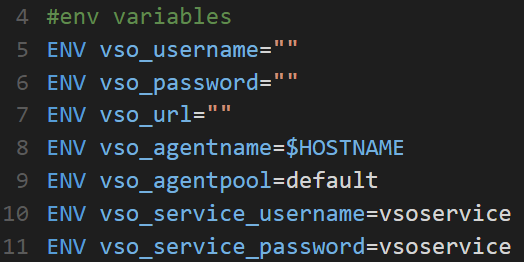 This extracts (installs) the vso agent in the current directory. Then run the agent. You cannot run as root so you need to switch to the vsoservice user (su vsooservice). With the node agent/buildagent command you install the agent. Because this is the first time it asks you for credentials (use the alternate credentials) and url etc. Et Voila ! We have our build agent running in a Docker container!! Now that we know all steps to configure our agent in a Docker container we need to make this more generic by creating a Dockerfile. On my host Linux I created a directory [docker] and created a new File called Dockerfile. I downloaded Visual Studio Code for editing files on the linux machine. The Dockerfile basically contains all statements that we executed before, prefixed within some Docker specific commands. In the screendump above you see a part of the DockerFile. Let me explain a bit. Line 1: FROM ubuntu:14.04 is pointing to the base image you will use. Line 4: RUN runs the command on the command line. docker build -t rvo/vsobuild:v1 . But now you have to login to the image and configure the agent. I want to have a self containing image that I can run, which automatically starts a build agent. 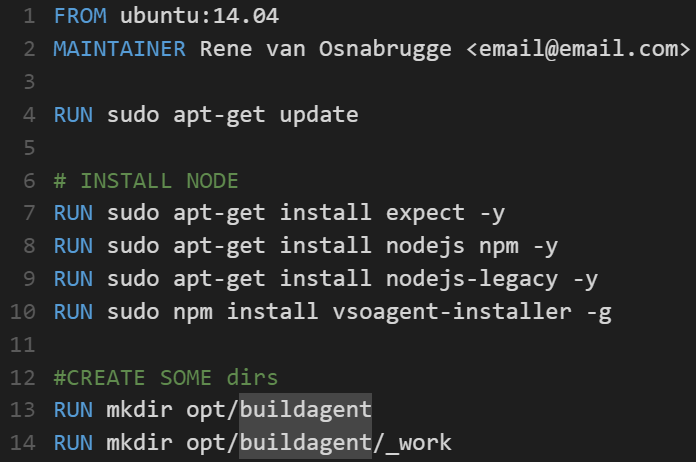 To configure the agent on the command line we need to navigate to our [opt/buildagent] directory and run the command [node agent/vsoagent] (just as explained above) and answer some questions about the installation. I wanted to automate those steps and answer the questions interactively. Note the $env(variable) placeholders. These are references to environment variables which we will send from the command line (later this post). Save this file in the same directory as your Dockerfile and call it ConfigureAgent.expect. We can run this file by typing the following command within our Docker image. Then we need to run this file every time a Docker container is started. For that we need a shell script. So we create a new file in the same directory called run.sh. This file contains the run command of the expect file. Because we need to run as vsoservice instead of root the syntax is slightly different. Save this script into a file called run.sh and add this file also to the Docker image by adding another COPY command and give it rights to execute. Those variables are present in the image once it is started and can be used everywhere. Now we need to build a new Docker image from this new Dockerfile and run this image by providing the environment variable values. Thanks for your reply. could you guide me how to build visual studio project in linux docker container. the project includes C#, .net and sql projects. I wonder if dockerized build agent can be used to build VS 2015 solution. May I do that? What I would like is to run new docker container, this docker container clones a certain branch from a git repo and builds it. If you use the windows server core image you can install Msbuild and git. You can use Chocolatey for that. I guess it would work if you do that.